If you just want to look at a pretty picture, you can stop now. If you’re curious about how this picture came about and are not afraid of some math, keep reading. Remember when I rented that 600mm lens for Seafair a couple years ago? I’m renting the 800mm this year…wish you were here. On my DX body, it’s effectively a 1200mm and it also comes with a 1.25 teleconverter for 1500mm of awesomeness. The Silhouette of a Bike Rider on Thursday, April 25, 2013 before the rising full moon. Photo by Philipp Schmidli. Another friend, Nate, was having a bachelor party that would involve lots of biking on Friday night. I was hoping to get everyone biking on top of the hill at Gas Works park, but the technical logistics don’t really work. Let’s go through the data. For Friday (8/1), the reverse bearing is . Moving out 1000 meters4 from the Gas Works Park hill (“S”) on a bearing of 78.1° puts us right over by I-5 (“D”) — so at least we’re on land. Note: the elevation profile (top) is the opposite direction as the map (bottom). Going back to the USNO, we could look up and find that at 22:43 the Moon will be at an elevation of 2.5° and an azimuth of 255.0°, or about 3.1° to left of where it would be at 23:00. We could keep playing this game until we found the perfect spot, but that still doesn’t solve our issue of being too close to the subject (i.e. the bikers at Gas Works Park). The tangent of an angle is the ratio of the length of the opposite side to the length of the adjacent side. In order to make the primary subject look smaller in comparison to the Moon, we are taking advantage of the fact the arc length (θ) of an object does not change significantly when your distance from the object is very large in comparison. It still looks cool, but not as cool. So, what else could I take a picture of? The “Black Sun” sculpture at Volunteer park is at ~137 m above sea level and the base of the Space Needle is ~2.77 km away at ~40 m above sea level. The top floor of the Space Needle is ~158 m above ground level which makes the top floor 198 m above sea level. Google Street View confirms that we have good view. I stopped by during the day to confirm the view and find a good spot to setup. The Space Needle “Halo” has a diameter of ~42 m which at a distance of 2.77 km gives it an arc diameter of — or about 1.7x larger than the Moon. The maximum angle of view of the Nikkor 800mm (on a DX body) is just 2° — thus the Space Needle should take up about 43% of the frame width. I’ve been doing some math, and on Sunday night I’ll head to up to the SW corner of Volunteer Park. That puts me on a 248 deg bearing with the space needle and the moon will be right behind it. At 2500m away, the halo of the space needle will still appear to be about twice the diameter of the moon and if I put the teleconverter on I think the moon + spaceneedle will fill the frame just about perfectly. So that was that. I showed up a bit past 11pm on the night of August 3rd, set up my equipment, and sat around listening to passersby play the piano as they filtered out of the park. I took test photos as the Moon grew closer and closer, and then just like clockwork…almost. I forgot to take into account the height of Space Needle relative to the elevation of the Moon, so the Moon was too far to the left for the picture I was hoping for — but pretty much dead on the calculations I made, even if I calculated the wrong thing. The halo of the Space Needle was at an elevation of . Add 0.3° for the arc radius of the Moon to get ~1.6° of elevation. Using the USNO table, we find the Moon at an azimuth of 245.6° at 23:50. The reverse bearing is 65.6° which puts me about 100m too far south-ish for the picture I wanted. Unfortunately, the right spot was blocked by trees…so it’s kind of a moot. The Moon became more red as it set. This is due in part to particulates in the air (e.g. pollution) as well as atmospheric scattering (i.e. Rayleigh scattering). 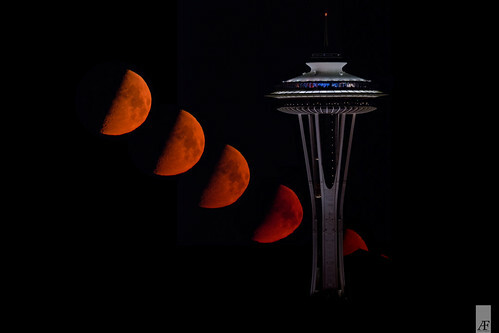 The luminance of the Moon decreased significantly during its setting, such that its exposure was almost the same as the Space Needle. The Moon is typically several stops above the ambient landscape, even when the landscape is lit up. If you’ve ever tried to take a photo at night, you’ll probably notice that the Moon looks blown out — this is why. The shape of the Moon gets a bit wonky as comes in line with the ground and picks up some heat shimmer. Charles Perko liked this on Facebook. Riley Gorder liked this on Facebook. Jim Ferguson liked this on Facebook. Bryan Denning liked this on Facebook. Andrew Loys liked this on Facebook. I got a 3021B Pro back in 2007. It’s a bit heavy, but otherwise I love it. Jacob Blount liked this on Facebook.